Though an international investigation has failed to provide any clear evidence that an intelligence failure allowed the Boston Marathon bombings to happen, like so many corrupt cops, environmental polluters, and moviegoers before us, it seems everyone forgot about Steven Seagal. Just like the drug dealers in Marked For Death, these terrorists attacked his family (America), and they made the wrong guy very, very interested in diplomatic missions to Russia, where Seagal helped to “open up doors” for a delegation of U.S. lawmakers like Republican Rep. Dana Rohrabacher—much as he’d helped to open up doors for Arizona Sheriff Joe Arpaio at suspected cockfighting rings, with much the same sense of grace and accomplishment. Seagal was a natural choice to provide the introductions due to his close friendship with Vladimir Putin, both men having long ago bonded over a shared inflated sense of their physical prowess and a wistful belief that it’s still the late 1980s. There’s also Seagal’s other Russian pals, Deputy Prime Minister Dmitri Rogozin and Chechen leader Ramzan Kadyrov—a man implicated in numerous cases of human rights abuse and murder, though both Seagal and Rohrabacher say he’s just misunderstood. 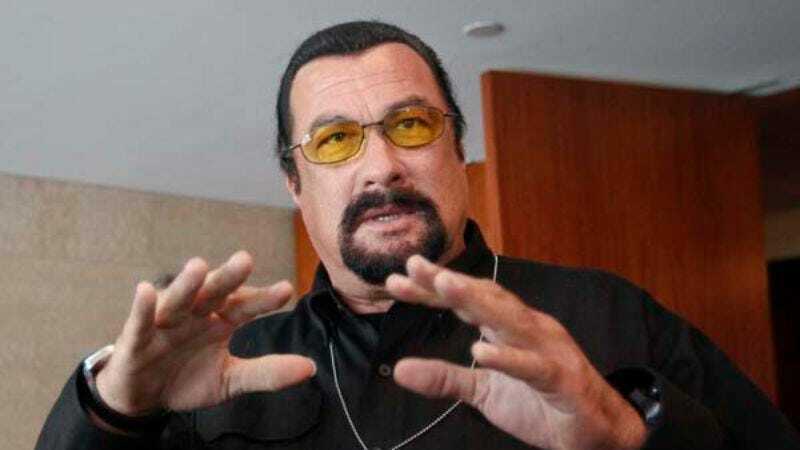 Still, despite these important connections and his oft-demonstrated detective skills, somehow the meetings between Steven Seagal and Russia’s leaders failed to produce any actionable information. “There is nothing specific that could've been done that we can point to that, had it been done differently, would've prevent this,” Rohrabacher said in closing the investigation, though she thanked Seagal anyway for having helped the delegation “make sure we accomplished our mission” to go to Russia with Steven Seagal and get their names in the papers. Still, Seagal’s mission of diplomacy wasn’t a total bust: Rogozin has announced he wants to continue this spirit of U.S.-Russian cooperation by having Seagal become “the face of Russia’s weapons industry” that has similarly swelled in recent years, becoming so large it needs a little goatee to frame it properly. “You’re ready to fight American (manufacturers) with your teeth and your intellect, and if Americans are prepared to promote and support you, that says we’re learning new ways to work on corporate warfare markets,” Rogozin said to Seagal in a statement that perfectly captures the confusing gibberish that is the idea of Seagal fighting anything without the help of clever video editing, or of Americans promoting and supporting him in his endeavors. Should Seagal accept Rogozin’s offer to become the world’s most sort-of-famous Russian arms dealer, it’s expected that Steven Seagal will then have to fight himself in at least three straight-to-DVD movies.